Nestled at an elevation of 3293m among the Garhwal Himalayas, Yamunotri is blessed with abundant exquisiteness and magic. It is surrounded by the lofty mountains on all sides and is one of the sacred centers in the Indian state of Uttarakhand. The origin of the stately Yamuna River, Yamunotri is known for its thermal springs, salubrious ambience and glaciers making it among the most sought after places to visit on a tour to pilgrimage centers in India. It is also believed that taking a dip in the Yamuna River offers heavenly blessings. Yamunotri would be an ideal site for those who love scouting craggy peaks and deep woods. Yamunotri Temple: Situated at an elevation of 3030m in the holy town of Yamunotri, Yamunotri Temple is highly visited by devotees from different parts of the world. It was erected in the 19th century and has been annihilated owing to natural calamities twice. The temple is devoted to Yamuna River and the idol installed in it is decorated with garlands. 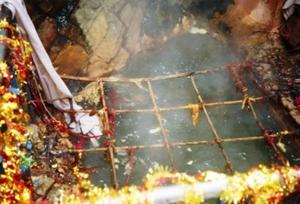 Surya Kund: It is the place where one can boil rice and potatoes and eat them as a Prasad. The water is so warm with a temperature of 1900 F. This hot water spring is called as Surya Kund that is situated nearby Yamunotri temple. 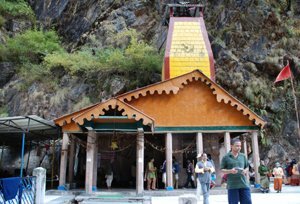 Janki Chatti: Among the most sought after tourist attraction in Yamunotri, Janki Chatti is positioned just 3 km away. It includes the last village in the area and the devotees are rendered with modest facilities over here. One must take a dip in the hot water springs of Janki Chatti which is a main appeal in Yamunotri itinerary and it is quite mystifying that in such pleasant surroundings how the springs remain hot. Kharsali: A beautiful place situated nearby Janki Chatti, Kharsali is one of the highly visited tourist attractions of Yamunotri. It offers nature exquisiteness at its best. Another beautiful appeal here is a very old shrine that is addressed to Lord Shiva. Barkot: Located just 49 kilometers from Yamunotri, Barkot is known for its ancient shrines and a serene ambience. It is visited by travelers and locals throughout the year. By Air: Jolly grant airport in Dehradun would be the closest airport to make it to Yamunotri, about 227km away. Delhi international Airport is located at a distance of 495km from the holy city of Yamunotri. By Rail: The nearest railheads to make it to Yamunotri are nestled in Dehradun and Rishikesh/Haridwar, which are 175km and 200km away. Both the stations are well connected to the main cities of India. Moreover, one can hire a taxi from these stations to reach Yamunotri. By Road: One has to park his/her vehicle at Hanuman Chatti as no road goes from this point. To reach Yamunotri, folks have to get on a trek of 14km from there. Bus services are also available from the cities like Delhi, Rishikesh, Haridwar, Mussoorie etc.